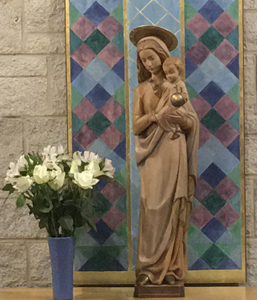 To see the roots of Mary’s title “Our Lady of Peace”, we are invited to Mary’s house in Nazareth. Here we find the source of Peace. To learn more about Blessed Dominic we need to look at some testimonies by Blessed John Henry Newman. When the Archangel Gabriel announced the great mysteries to the Virgin Mary and when her answer was “yes”, all of heaven became speechless in awe. The moment of the Annunciation affected the history of mankind. In this scene, we find the source of stability and peace. Our Mother is rightly recognised as Our Lady of Peace and as the Bride of the Holy Spirit. Her peace was demonstrated again and again throughout her life. The Beatification of our patron Blessed Dominic Barberi, an Italian priest, by Pope Paul VI during the Second Vatican Council took place on 23 October 1963. 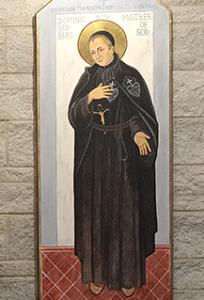 This was in tune with the tone of the spirituality of Vatican II, with emphasis that the loving presence of the Lord in the life of Blessed Dominic affected a great number of people in England. Dominic was born on 22 June 1792, the eleventh child of Giuseppe and Maria Barberi. His father died when Dominic was six years old, his mother when he was eleven. When he was twenty-one, he wrote, “I was saying my prayers, I heard a voice which said to me, ‘I have chosen you to announce the truths of the faith to many nations’. The idea pleased me.” He then became a lay brother of the Passionists. At 26, he discovered his vocation as a priest. “I went for a few minutes into the Church to pray before the altar of the Blessed Virgin, and while I was on my knees, the thought occurred to me. I understood I was to labour in England. I would become a cleric and a priest.” Dominic was ordained as a priest on 1 March 1818. He began studying the English language and eventually he came to England, to Aston Hall, Staffordshire. It was there that Dominic established the Passionist Congregation in England. He started his mission from practising tender love of enemies and a passionate faith in Jesus present in the Blessed Sacrament. He promoted Eucharistic processions. Then many became interested in his style of delivering God’s message. There is a story where he kissed a stone that was thrown at him, after which the aggressors became Dominic’s followers. In August 1849, Dominic was returning to Aston Hall from London. About five miles from Reading he fell desperately ill and was taken off the train to be attended by a doctor. As there was no room for him at the small station of Pangbourne, he was put back on the train to Reading. Dominic died in Reading on 17th August 1849, at the age of 57.